A Charming Letter from a Father to a Daughter with Illustrations. 1921. A playful yet instructive letter from a father to a daughter who presumably is away with her mother. Perhaps she is recovering from an injury. It begins with the father acknowledging how his daughter’s improved use of her hands and encouraging her to continue. It proceeds to discuss a crying baby and how unbecoming crying is to older children. He discusses his experiences sleeping in a conch hammock, under the stars and an itemized list of items he found in a drawer. Written in a lighthearted manner with naïve illustrations. Twelve (12) Ink and Gauche Illustrations of Cartoon and Comic Characters of 1926. Done on heavy card stock and include characters from Bringing up Father and others they are “Father, Maggie, Spark Plug, the Captain, Buttercup, Jiggs, Happy Hooligan, Barney Google, Mac two (2) different views of Tillie and Dolly Dimples. Dated in 1926. Measure 11” x 7”. Vibrant color. Naïve yet well executed. Pencil & Watercolor Sketches Promoting F. S. Streeter Marble Works, Reading PA. ..
Four (4) different naive pencil and/or watercolor drawings promoting the marble works. Three of the four are mounted on what appears to be a page from an album with embossed frames. Also includes a watercolor cameo at center when lifted exposing a watch paper with his name and location in pen. Miniature writing of Mutat Terra Vices at base. Imagery includes heraldic lion, pyramid, Cupid and an angle. Sheet measures 10" x 8"..
"Executed Beauty with a Pen " Portrait in Pen & Ink with Watercolor Embellishmentsby A. Thurber. A portrait of a woman done predominantly in black and brown inks with an interesting addition of stippling on parts of the face and neck. Watercolor decorated flowers in her hair, delicate earrings and hair comb complete the scene. Well executed in a naive manner. 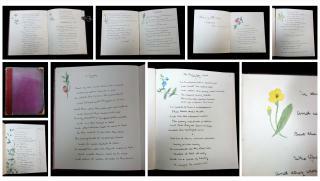 Calligrahy caption on mat with circular opening reads "Executed Beauty with a pen By A. Thurber". Sight view 10 3/8" x 8 1/4". Housed in period frame. Light toning. Three (3) different scenes of family life at home with loving scenes of parents, grandparents and children. Well excecuted with fine detail Vivid Color. .
A truly fanciful fellow with a printed face,and card stock body parts that have been decorated with applied and layered polished and foiled papers. His exaggerated hat has a large applied flower. His bodice begins with pleated paper dickey and velvet bow tie; a crest is applied beneath the dickey. His waistcoat is constructed of various foiled papers with red embellishment and embossing. His topcoat is velvet with studded border trim topped with a large red silk bow. The arms and legs are jointed at the shoulders, elbows, hips and knees..
A 12" Scotsman dressed in a traditional kilt with with shoulder sash and belt. Embellished with feathers on his hat and belt. Finely detailed facial and hand features. Not the detail on his stockings. A simple string mechanism allows him to dance..